Notes: Château d'Hauterives is a castle located above the homonymous village, on Sainte-Enimie town in Lozère, France. 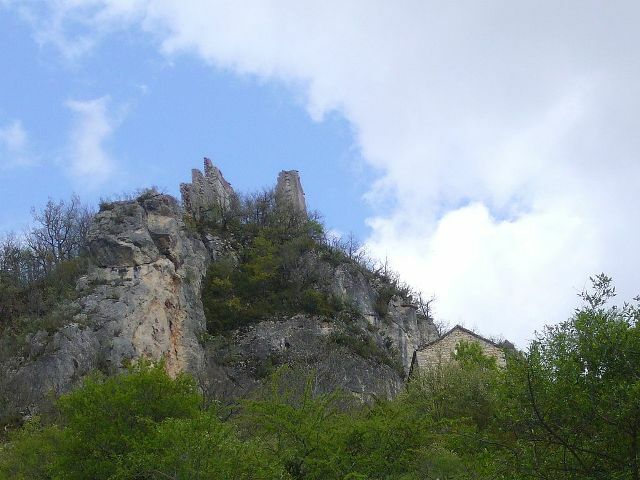 Formerly capital of the Viscount of Hauterive, it is now in ruins (It already was in 1724), and of difficult access, no road to the village of Hauterives.Built in the twelfth century by the lord of the castle Séverac to protect among others the Causse Mejean, the castle along with the land of Sévérac return in 1508 to the enjoyment of the family of Arpajon who since 1385 had had the lordship Sévérac-le-Château, by marriage of Hugh Arpajon Jeanne Severac. Next Mr. Monestier is Gui I Arpajon, then alive, who described the first Viscount of Hauterive; Next History of the Great Officers of the Crown, it was John III of Arpajon his son alive in 1514. The Lordship of Arpajon was one of twelve manors mansions giving right of entry to particular states of Gevaudan. it was destroyed between 1629 and 1634.